“Déjà vu feeling once again!” wrote a user on microblogging social media platform while posting a photograph of Catholic Christian leaders meeting UP CM Yogi Adityanath at his office in Lucknow. The media covered the meeting on April 22, 2017 with the headline, “Catholic priests meet Yogi, request freedom to worship without fear”. 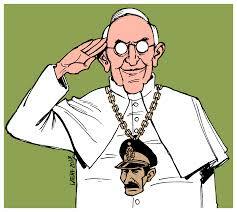 The Catholic leader Fr. Gerald John Mathias told the media that, “We requested the chief minister to ensure the safety and security of our places of worship, and the freedom to worship without fear” But what makes that social media user to feel “déjà vu” in this simple visit? Nothing abnormal in expecting freedom to worship, isn’t it? The reason behind the sense of déjà vu is simple, but very hard to find out. Such statements and carefully manufactured narratives are part and parcel of Indian Christian groups’ Perception Management Mechanism. 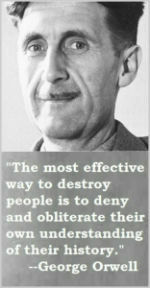 They are masters in developing convenient narratives, manufacturing perceptions subtly demonising their opponent i.e. Hindu organizations. BJP registered a colossal victory in Uttar Pradesh assembly elections in March 2017 with 325 seats, it was a brute majority in the recent past. Everyone in BJP- NDA camp was celebrating it and opposition was busy in finding all new excuses and developing narratives for the pitiable electoral debacle. But highly professional and ruthless executors, the Catholics in India, were busy in their time-tested game of delivering subtle message to their followers and to Hindus in India. The message was loud and clear, that the newly elected BJP government in Uttar Pradesh, headed by Yogi Adityanath is going unleash state terror against Christians in the state. Keeping in mind the same, they met UP CM Yogi Adityanath and ensured ample media coverage was given to the event. The central, but subtle message of the meeting was that the Christians are never safe under a BJP rule and Hindutva groups are likely to attack Christians in UP. Before we delve into the so called cases of Christian persecution in India; either under BJP’s Hindutva rule or by Hindutva groups under non-BJP rule, let us look at the hypersensitive, propagandist and the malicious rhetoric by Christian leadership in India, solely aimed at manipulating perception about the so-called atrocious acts and deeds of India’s Hindu groups and BJP. Whenever any Hindu organisation announces a programme, or any elections approach wherein the BJP is likely to emerge victorious, then the well-established Christian leaders, denominations and groups indulge in aggressive media propaganda, expressing concerns about the safety of common Christians in India. The whole swathe of mainstream Indian media gives prominent place to such manipulative propaganda by Christian groups, helping them to establish clear edge over Hindu groups in the battle of perception. Without proper knowledge and exposure to the issue, the bystanders develop a negative attitude towards Hindu organisations, while simultaneously believing Christians as the poor victims of majoritarian violence. With a tight grip on Indian media and Indian intelligentsia, the Christian groups carefully and tactically plant news about religious persecution, which does not always reflect the ground reality. They have a strong global network of media houses and web portals, which they fully utilise to spread the word globally, once the news is published in the Indian media. It makes cascading effect globally, reporting and publishing the same story in a different form. Then, the so-called social activists, human rights groups and tribal rights bodies jump into fray, to seek stringent action against Hindu groups. Veteran author, journalist and researcher Mr. Arun Shourie has coined a meaningful term to this well-oiled propaganda machinery (ref: Harvesting Our Souls). He used to call it as the “eco chamber” in which the false news of Christian persecution or anti-Christian violence continues to make rounds locally and globally for months together. Here we have compiled a list of a few incidents wherein the Christian groups have used their propaganda machinery to create a false persecution narrative by accusing Hindu groups of perpetrating incidents in which they had no role in reality. Let us have a brief look into each of these incidents. Case 01: When 2004 general elections were approaching and the BJP led NDA under Vajpayee was seeking reelection, The Baptist Press published a report on April 26, 2004 with a heading, “Indian Christians apprehensive as general elections proceed”. The report says, on the one hand, BJP is wooing Christian voters by inducting Christian leaders in its fold, especially in Kerala and on the other hand, it is supporting militant Hindu organisations like RSS and Bajrang Dal! The article also has strong objection to the BJP manifesto, which makes a reference to legislation of anti-conversion law for putting a stop on unethical conversions. It says, though BJP is seducing minorities for electoral gains, “BJP’s national leadership leaves one in no doubt that the party and the NDA are wedded to the communal politics of the RSS”. Also the report has expressed its reservations to re-conversion programs held by VHP, though there was neither force nor inducement in it and has branded the reconversion programs as anti-minority. The report also claims that violence against Christians in Jhabua, Madhya Pradesh were orchestrated by BJP, interestingly no organisational connection could be established by independent probes and investigating agencies. Yet, Christian groups keep repeating these allegations. Manipulated Perception: What they wanted to convey to Indian people and the world audience was that BJP and its ideological mentor RSS conglomerate are not safe for Christians and there would be an existential threat to Christians if BJP returns back to power after general elections. The All India Christian Council (AICC) President, Dr. Joseph D’Souza demanded central government’s intervention to ban Kumbh, since, according to him, Sangh Parivar was conspiring to create another Godhra type disturbance. What does it mean? Who was the perpetrator of Godhra? Who conspired to burn the train packed with karsevaks? Was it Sangh Parivar? AICC also created a propaganda saying RSS was trying to “Hinduise” the tribals inhabiting the Dang region, which was a Congress bastion, politically!” Subtle argument in this propaganda was that, if tribals get proselytised then it is OK, but they must not be mainstreamed into larger Hindu society! To further reinforce their propaganda, they even brought in the non-existing environmental concerns! As per AICC, Kumbh would have inflicted irreparable damage to Dangs environment. They reminded RSS of the noble Hindu tradition quoting that there are only four Kumbh Melas as per Hindu traditions. While at other times, these same people have ridiculed traditional Kumbh Melas, now they invoking the sanctity and traditional validity of the Four Kumbh Melas to discredit RSS Kumbh! Manipulated Perception: RSS does not respect Hindu traditions, The Kumbh arranged by RSS is going to destroy tribal culture by forcefully Hinudising them and the function will cost local environment dearly. Case 03: The Evangelical Alliance Foundation published a report titled, “Shabri Kumbh Mela threatens 800 Christians in Dangs”. The said report is concocted assertions, singularly focused at tarnishing the image of RSS and its affiliates. 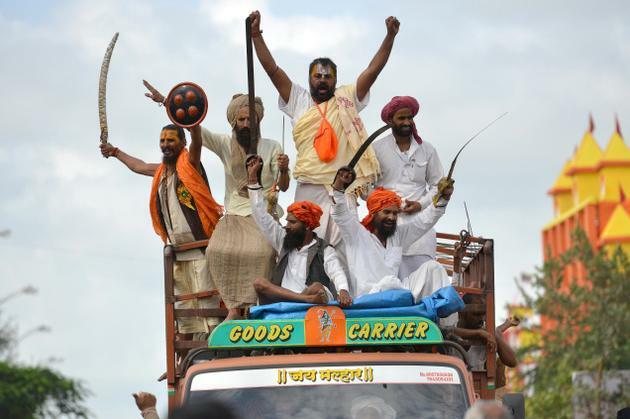 The report says, “Hindu nationalist groups and their militant factions will hold Kumbh (Hindu festival) in Gujarat, called ‘Shabri Kumbh Mela’, to deal a death-blow to Christian missions”. As per Evangelical Association, the two aims of Kumbh were, “to convert tribal people to militant Hindu nationalism, and to emancipate them of Christianity, as it challenges the status quo and threatens to liberate the enslaved tribal”. One would like to ask them, who is enslaving the Indian Tribal? Which status quo is Christianity challenging? 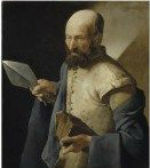 Who has assigned this “noble” task to Christians? The report notes that RSS has invented whole new mythology of Shabri Goddess and deliberately developing the pilgrimage site in the name of Shabri! The report further mentions that Act Now for Harmony and Democracy (ANHAD) had filed a petition in Supreme Court against a CD which was getting sold in Gujarat and Maharashtra, openly appealing for killing and beheading Christians. As per ANHAD petition, the CD was produced by Kumbh Committee. The question is, despite the SC directing the state and central governments to investigate the matter, why did the investigation stop as soon as the Kumbh concluded? Why did ANHAD silently pulled out its SC petition? The answer is obvious. Let us not forget to mention that ANHAD is the same organization which was vocal during Godhra riot cases and were trying to grill then Gujarat CM Modi and Amit Shah. They also share a clear bonhomie with Christian missionaries in Gujarat’s tribal belt. Finally, the EA Foundation report ends with an appeal for urgent prayers to safeguard 8000 Christians of Dang to save them from Hindu fury! Manipulated Perception: While reporting the news of Shabri Kumbh, the report repeatedly used terms like fanatic, radical, militant Hindu groups arranging Kumbh in Dang. Uninformed readers would definitely get an impression that the RSS is hunting and killing Muslims and Christians everywhere in India! Case 04: Let us take another interesting news, third in Kumbh matter. The newspaper DNA has published this news with title, “Activists demand ban on Kumbh“. The activist in the report is Shabnam Hashmi of Act Now for Harmony and Democracy who had demanded a ban on the Kumbh, as, according to her, it attempted to forcefully convert tribals into religion! But, the same activist, who apparently feels so strongly about maintaining the different way of worship of the tribal society, never showed similar concerns when Christian missionaries were carrying out conversion programmes in the Dangs region. Though, the report makes a mention about the RSS plans to stop conversions by Christian groups, there is not a single word censuring conversion activities carried by Christian groups. Manipulated Perception: This is one more example of managing perceptions. The report aimed to create an impression that tribals were different from Hindus and that RSS led Kumbh was trying to convert them to Hinduism. Case 05: Christian Today portal declared that “Church fears BJP coming to power” before 2009 general elections, in which BJP actually failed to perform. The apex body of Catholic Christians in India, Catholic Bishop Conference of India (CBCI) declared, “The Catholic Bishops Conference of India expressed apprehensions over the electoral victory of Bharatiya Janata Party (BJP), which it fears might continue its ghastly attitude over minorities”. What is the basis of these apprehensions? Which factors really compelled Christians to fear about BJP’s possible electoral victory? The CBCI statement says that BJP is accused of fanning communal feelings and pursuing Hindutva agenda, which instigates violence against minorities, the Kandhamal violence against Christians being evidence of it. The CBCI conveniently ignored the fact that it was the brutal murder of Hindu saint Swami Lakshamanananda Saraswati, the most revered figure among Kandhamal tribals, which triggered the violence that broke out in the aftermath of his murder and BJP was nowhere in the picture..
Another allegation made by CBCI was that Hindutva groups tried to amend the constitution to take away minority rights during the last BJP rule. The fact that BJP neither had majority on its own in the parliament nor had any tight hold over its alliance discredits any such allegations about ‘amending constitution’! Manipulated Perception: CBCI, which boasts of being a responsible body, carefully spreading lies that every incidence where a person belonging to minority community is a victim is due to RSS-BJP! At a time when BJP did not even have political strength in the parliament to touch the constitution, CBCI blames BJP for trying to tamper with the constitution. The CBCI openly blames RSS for violence against Christians in the Kandhamal region ignoring the fact that the violence was actually triggered by the murder of a Hindu religious leader and was a spontaneous and unorganized response. The underlying message in their report was that BJP and RSS commit violence against minorities and do not honour the constitution and hence defeating them in the 2009 elections was the need of the hour to safeguard Indian Constitution and minority community! Case 06: After Sonia-Manmohan led UPA alliance wrested power for a second consecutive term in 2009, the portal of Australian Catholic Bishops Conference, CathNews declared, “Indian Christians rejoice at election of secular government”! On day one itself, Catholics declared UPA government as secular government, despite the fact that the Congress party has a dubious track record of tampering with the constitution in the famous Shah Bano case to appease minority vote bank. But, the Catholics portal declared that UPA is a secular government, for the singular reason that they would turn a blind eye towards the rampant evangelisation of the poor and gullible Indians by Church! The ecumenical All India Christian Council (AICC) joyously saluted the Indians for their “consummate and decisive” rejection of divisive and sectarian (read BJP) political forces in the elections. Another Christian leader Fr. Hector D’Souza, who heads the Jesuits in South Asia, expressed hope that the new secular government would stop atrocities and persecutions of religious minorities in India, such as attacks on Christians in Kandhamal, Orissa and other states. Which are these “other states” where Christians are attacked? No mention of the incidences and states where it happened. To create fabrication, ambiguity is a must! It keeps people guessing. Manipulated Perception: Through this report, they conveniently portrayed the Congress led UPA as the “secular” front, while insinuating that RSS-BJP were communal forces. Despite the fact that the Kandhamal riots happened when the UPA was at the centre, they manipulated the message to portray BJP as the culprit and to convey that minorities will not be safe under BJP, since RSS conglomerate is anti-minority with deep hatred for Christians and Muslims! Case 07: When Narmada Kumbh was organized in Central India’s tribal belt of Mandla, the Christian Today website in one of its stories warned people to be “Beware of Sangh Kumbh Melas”. Since Narmada Kumbh, which to create awareness about the rich tribal culture, posed a threat to conversion activities of Christian missionaries, they declared the Kumbh as a political gathering and demanded the enforcement of anti-conversion laws against those doing Ghar-Wapasi! Another argument in the report was that Hinduism “came” from outside and thus making a reference to the controversial Aryan Migration Theory, which has been repeatedly challenged by many scholars and archaeologists! Yet another point made in the article is that the Sangh Parivar organizes all kinds of melas in areas legally protected to preserve the traditions and cultures of tribals and other aboriginals under Schedule Five of the Constitution. The question is, if that is the case, then what are Jesuits and Christian missionaries doing in those protected lands? » Vinay V. Joshi is the Director of Institute for Conflict Research and Resolution (ICRR), a defense and security think tank based in Guwahati. My wife and I were close witnesses to the happenings in Varanasi from 22 September to 23 October. We present here an account of how we experienced these happenings. On 20th September we went to Srividya Math to meet Swami Avimukteshwaranand Saraswati. Around 20-30 people from the Durga puja samitis had gone also to meet him. They were telling Swamiji that the Allahabad High Court had issued an order prohibiting the visarjan (immersion) of the murtis (images) in the river Ganga. Last year it was authorised as an exception, but this year the order would be enforced. During the conversation that followed, it was mentioned that the High Court had previously issued orders to stop the sewers from releasing dirty water into the river, about which nothing had been done. The Assi Nala is continuously releasing thousands of litres of extremely dirty water and nothing has been done to date to prevent it. 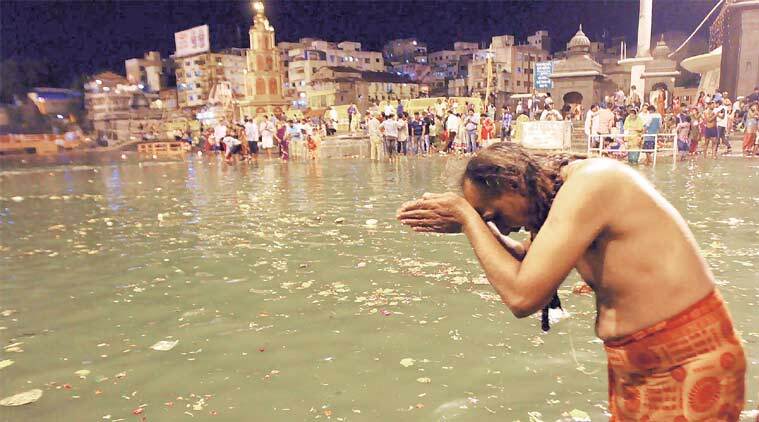 According to some estimates, dirty water from cities amounts for 60% of the Ganga pollution, factories for 35% and 5% comes from religious actions. It was said that the solution laid in constructing eco-friendly murtis which would not use dangerous chemicals. The puja samitis said that they were ready to pay more for these kind of murtis. The people of the samitis requested Swamiji to help them in this endeavour. Swamiji said that he was ready to fight for dharmic causes, but that usually “I go ahead, and when I look back nobody is following me”. There ended the meeting. Next day, a procession that was proceeding to Ganga for visarjan of a murti of Ganesh was stopped near Godowlia by the police, who asked that the visarjan should be done in a kund. People did not understand why the police had not stopped the procession in the pandal, and had allowed it to proceed to Godowlia. People were keen in having visarjan in Ganga, but the police let them stay there along the Ganesh murti for many hours (36 hours in total). After 24 hours had passed, Swami Avimukteshwaranand Saraswati thought that it was not proper to stop the murti of Ganeshji, on which pranapratishtha had been done, in the middle of the road for hours. He went to Godowlia and sat there in dharna along with many other people. The result of this brutal action by the police provoked a deep indignation among the people of Banaras. The video of the lathi-charge was also instrumental, and clearly countered the police efforts to say that nothing had happened. The Ganesh murti was taken by the police and thrown in a haphazard way in Lakshmi Kund. All kinds of people, including several groups of Muslims and representatives of all political parties, came to meet Swamiji and the other injured at the hospital. When he came out of hospital two days later, Swamiji went to Kedar Ghat and did a puja of a Ganesh murti fashioned with Ganga clay; a symbolic proper visarjan in Ganga was then done. Around twenty or thirty policemen were present; it looked as if a big criminal was there. Only then Swamiji accepted water and food, for he had not taken any during these days. After this, daily meetings were held at Srividya Math to consider possible actions. Many people attended and presented their views. The indignation at the police action was prevalent. The Varanasi Administration did not show any regret about the police lathi-charge, nor any action was taken against the responsible authorities. Only later, on the force of the video recordings and the media attention, an impartial inquiry of the happenings was reluctantly agreed upon. In one of the meetings a representation of Kashi pundits came, and explained that, according to the shastras, visarjan should be done in running water. Although the tradition of murti visarjan as done nowadays with large images shown in pandals is only one or two centuries old, still the tradition of making murtis from Ganga mud or other rivers and releasing them in the same place is there since time immemorial, and rules for this are given in the shastras. Also came to different meetings politicians, boatmen, murtikars, etc. The murtikars, the people who construct the statues, said they were ready to construct eco-friendly murtis, even if that would be harmful to their business. Of common accord it was decided to call a procession “Anyay pratikar yatra” on 5 October. People were to meet at Town Hall and proceed peacefully towards Godowlia and to the river Ganga. A number of sadhus were there, along with representatives of most political parties except Samajwadi Party (in power in Uttar Pradesh; however, some members of this party attended personally) and many common citizens. Also attended a few dozens of Muslims. It is to be mentioned that, during the discourses in Town Hall, Swami Avimukteshwaranand took away the microphone from the hands of Sadhvi Prachi when she started to communally polarize the event by making remarks about the Muslim community. Swamiji ordered that the procession should proceed in peace, that no political party’s banners should be shown (although later a few were), that no “murdabad-zindabad” slogans should be raised, etc. Everything should proceed in a peaceful atmosphere. The procession started peacefully from Town Hall, Maidagin, towards Chowk and Godowlia. Probably from 50,000 to one lakh people of all religious and political tendencies participated in the march. From the houses and terraces along the way many people were looking, encouraging and supporting the march, throwing flowers and giving drinking water to the participants, etc. 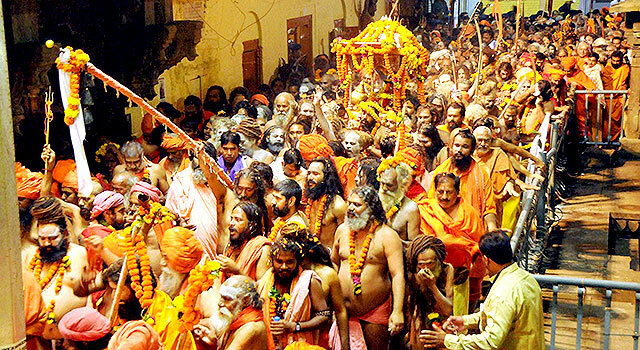 The procession was headed by a representation of Kashi Viswanath; behind were several swamis, then women, then the rest of the people. I was at 30-50 meters behind the head of the procession. In Bansphatak, before getting to Godowlia, we saw a column of black smoke rising ahead. Shortly after, people started to run in stampede. I tried to protect a startled old dandi swami from being trampled upon, then fell down. Tear gas spread and made us all cry. There was a lot of confusion. Nobody was knowing what was going on. We later came to know that, before the procession reached Godowlia, a group of people concentrated from the other side of Godowlia and started to burn motorcycles and throw stones at the police. There was extreme violence and several people, including policemen, were hurt. However, as shown clearly in some photos, a part of the police seems to have collaborated to some extent in spreading the troubles. The photographer who took photos of several policemen burning a motorcycle was strongly beaten and had to go to hospital. Who were responsible for the violence is not yet clear. But whoever the culprit, they succeeded in converting a peaceful movement into a violent one. 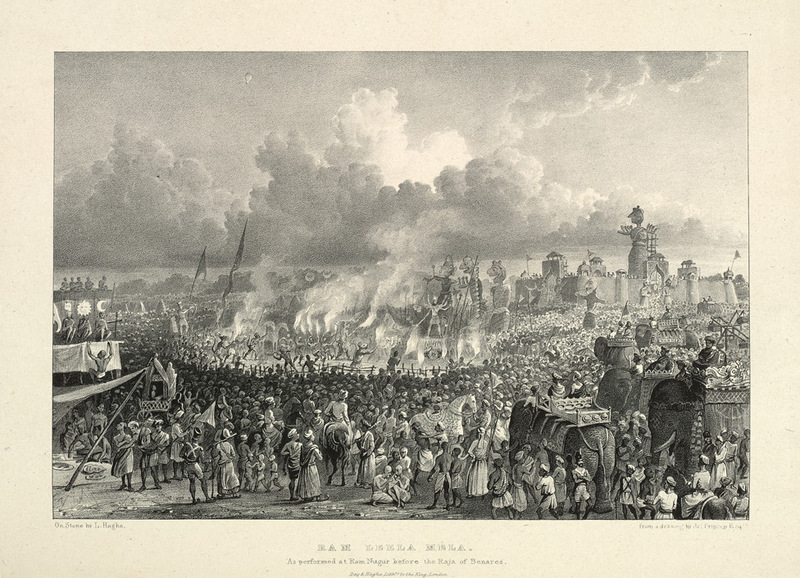 After that, no one gave attention to the fact that many tens of thousands of people had united in a peaceful demonstration, an event unique in the story of Varanasi. After this, the Administration reacted strongly. Many people were arrested and put into jail. A long list of cases: sedition, loot, dacoity, attempt to murder, etc., were charged on Swami Avimukteshwaranand Saraswati, other swamis and Ajay Rai, leader of the Congress. 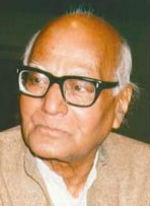 Ajay Rai was arrested and sent to jail, although several political leaders did exactly the same as he did. Afterwards, without trying to bring out any meaningful negotiation or compromise, the Administration threatened the puja samitis with dire consequences (jail, etc.) if they did not do the visarjan in the places marked: two ponds constructed in a hurry at far away places. The atmosphere was of police dictatorship. The Administration succeeded in forcing people to do visarjan as they wanted, but then nobody was satisfied and a sense of bitterness had spread in Varanasi. Our personal opinion is that all the problems can be traced back to the Administration’s intransigent behaviour. First, stopping the procession with the Ganesh murti in the middle of the road without clear options or way out. Next, the brutal lathi-charge on cornered, peaceful people which reminded one about the times of the British Raj and Mahatma Gandhi. Later, the absolute obstinacy and refusal to negotiate or bring out a compromise. A small problem which could have been easily solved to the satisfaction of all was, by treating it as a law-and-order problem, converted into a big and dangerous issue. 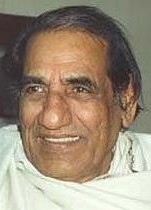 Moreover, instead of concentrating on the main sources of pollution of Ganga and the lack of water current that makes this pollution much more dangerous, the Administration has concentrated on a very minor source of pollution and chosen a soft target where results can be shown without hard work, just by applying force. Even this minor source of pollution should be avoided, on this everyone agrees. Apart from its religious significance, the murti visarjan is an important part of the festivals. To do the visarjan in a far away kund built for the occasion, without any religious significance and where the symbolism is killed, is not a good solution. If the murtis contain dangerous chemicals, these are also venomous in the kunds (in the new constructed kunds the water will return to the Ganga or filter down to the aquifers). Prime Minister Narendra Modi has agreed to a request to write to US President Barack Obama on issuing of postage stamp on Diwali by the US Postal Service, an individual behind the years long campaign has said. The request in this regard was made by an Indian-American couple from New York—Ranju and Ravi Batra who met Modi at the UN General Assembly on 25th Sept when the Prime Minister went there to address the Post 2015 Sustainable Development Agenda Summit. Ranju, as chair of Diwali Stamp Project, updated Modi on her multi-years’ Diwali Stamp efforts along with Congresswoman Carolyn Maloney, a media release said. 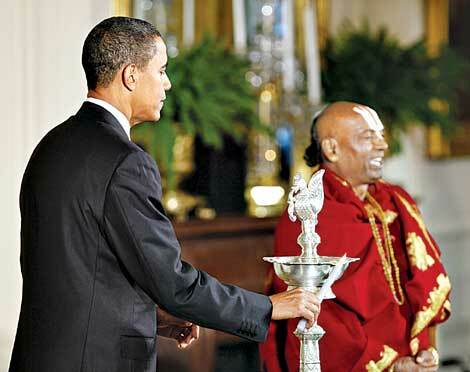 During the brief encounter, Ranju urged the Prime Minister to write a letter to Obama in support of the Diwali Stamp being issued by US Postal Service. “The Prime Minister agreed to do so and said, ‘I will write (to) President Obama (for) supporting the Diwali Stamp’ and took the note as a reminder,” a media release said. The US Postal Service has issued stamps on all major religions of the world excluding Hinduism. Obama is the first US President to personally celebrate Diwali in the White House. For more than a decade now several efforts have been made towards issuing of a postal stamp on Diwali by the US Postal Service. Dozens of US lawmakers have written in this regard to the US Postal Service, which has also received thousands of signed letters from Indian-Americans. 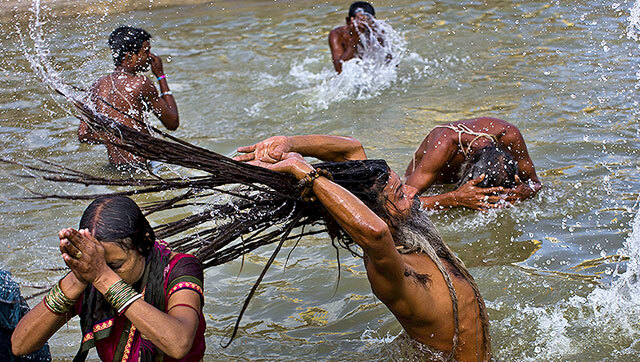 Dreadlocked Indian holy men and waves of Hindu pilgrims washed away their sins with a religious dip on the first main bathing day of India’s massive Kumbh Mela festival. 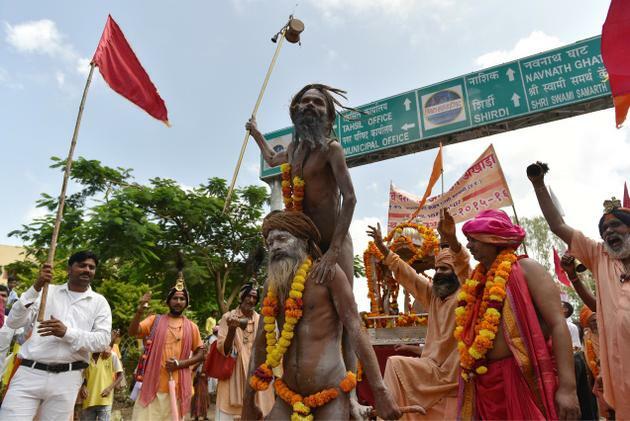 The sadhus, naked and with their faces painted, danced and chanted as they jumped onto a holy ghat at a temple in the western Indian state of Maharashtra. 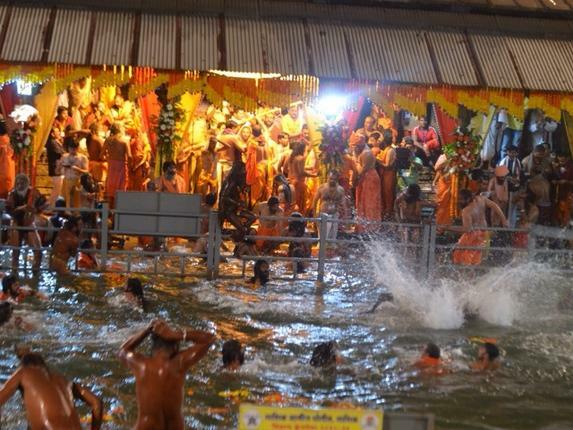 Tens of thousands celebrated the ‘Shahi Snan’, meaning “royal bath”, with Hindu sects following one another in shedding their orange robes before splashing joyously into the sacred water at Nashik. Their time to bathe lasted just seconds, however, as hundreds of police officers frantically blew their whistles to signal for them to hastily make way for the next wave of devotees. 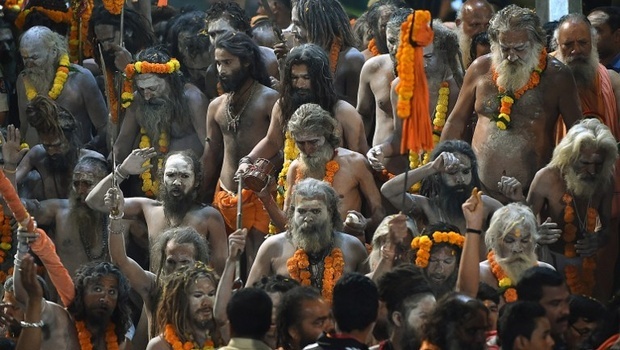 The Kumbh Mela, a celebration of faith in which Hindus bathe in a sacred river, is held every third year and is rotated between four holy sites. 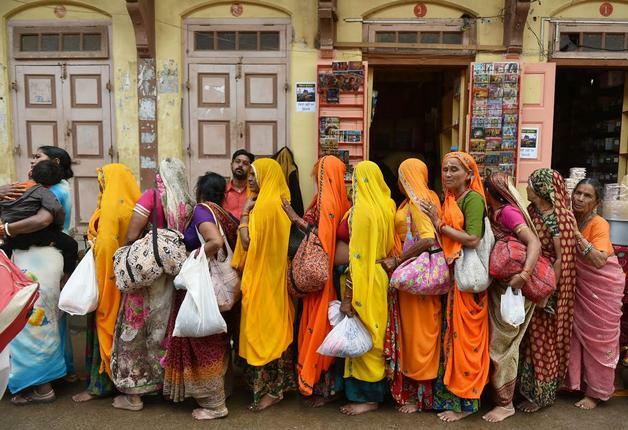 As a result, it takes place at Nashik every 12 years and although it isn’t on the same scale as the editions on the Ganga at Haridwar and Triveni at Prayag (Allahabad), it still draws millions of pilgrims. Organisers had increased safety measures in a bid to avoid a repeat of a deadly stampede at the same venue 12 years ago, and said the mass bathe had so far passed without major incident. “No, nothing like that, it all went well,” K. Moghe, the district information officer for Nashik, said. Thirty-nine pilgrims were trampled to death when the religious festival was last held on the banks of the Godavari river in Nashik, around 160 kilometres (100 miles) from Mumbai, in 2003. The crush was believed to have been triggered when a sadhu, or holy man, threw coins into a crowd of pilgrims who were growing increasingly impatient at having to wait for their turn to bathe. When the coins were thrown they scrambled to gather them, resulting in dozens of people suffocating, according to reports at the time. Nashik is unique out of the four venues in that it has two main bathing sites, Panchavati on the Godavari river in Nashik and nearby Trimbakeshwar temple ghat, stretching the emergency services across a wide area. For this year’s edition, officials changed the routes to the ghats to avoid steep slopes while a massive police presence of around 20,000 officers ensured little overcrowding and first aid workers stood ready. The first sadhus entered the water at Trimbakeshwar shortly before 4 am with a continuous flow of devotees rejoicing in the bath for several hours afterwards. 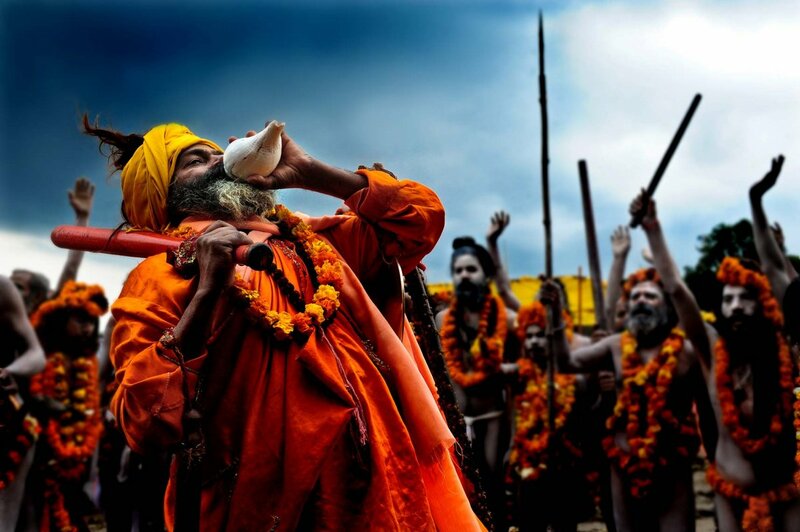 The Kumbh Mela has its origins in Hindu mythology, which describes how a few drops of the nectar of immortality fell on all of the places that host the festival, the fourth being Ujjain in central India. Far from becoming obsolete over time, the Ramleela is set to conquer the western world as well. In July 2013 an International Ramleela Conference was held at the University of the West Indies and a World Ramleela Council was established. The major aim was to promote the Ramleela as a cultural heritage internationally. Ram, the prince of Ayodhya, lived many thousand years ago. Yet even today most people in India know in detail his eventful life story, which is recounted in the Ramayana. Not only in India—in Nepal, Myanmar, Laos, Thailand and Indonesia, too, Ram had great influence on art and literature. An international Ramayana festival last year in Bangkok made clear, how alive Ram is even today and which great importance the Ramayana has in Southeast Asia. “If Asia has an epic in common, it is the Ramayana”, was declared in Bangkok. Valmiki, supposedly a contemporary of Ram, narrates in 24.000 Sanskrit shlokas vividly the life story of the prince, who later becomes the king of Ayodhya. In the 17th century Tulsidas wrote the story of Ram in colloquial Hindi and made it even more popular. Ram is an ideal, an outstanding example for others—noble, just, brave, ever protecting the weak, and doing the right thing at the right time. He is ready rather to die than to break his word and prepared to wage a war to rescue his wife Sita who had been kidnapped by a demon king. Sita, the princess who marries Ram, possesses all the virtues, which a woman is supposed to have according to the ancient rishis. She is modest, chaste, always intent on the wellbeing of her husband, warm-hearted, full of trust in god, considerate, graceful—and exquisitely beautiful. For Ram to be a model for others, he has to have a difficult life. And he indeed faces countless, unexpected complications and hardship. For example on the very day, when the handsome, much-loved prince is to ascend the throne, his father Dasaratha, caused by an intrigue in the palace, has to send him into exile for 14 long years. It breaks his father’s heart. Ram calmly takes off the festive robes and dresses in a simple dhoti. Sita and his brother Lakshman insist on joining him. And so the three of them finally walk out of the town into the forest—and the whole of Ayodhya weeps. The lila culminates after Dussehra, when Ram returns to Ayodhya after his exile and takes over as king. Every evening before the play, pooja is performed for the actors and thereafter they are considered to be true embodiments of their roles. Many people touched respectfully the feet of the 12-year old boy who played Ram, when there was an occasion during breaks. The actors were right in the midst of the crowd. There was a festive atmosphere with food carts and stalls selling trinkets. When Ram went into exile, several thousand spectators walked with him around two kilometres to the place, where the next episode would unfold. An amazing experience in itself. Georg, a college mate from Hamburg, had planned a trip to India on short notice. He sent a letter to my address in South India asking whether we could meet. “Write to American Express in Delhi as I will be soon in Delhi”, he wrote. Yet I knew nothing of that, as I was in the North and his letter was lying in the South. (Those were the times before email and mobile). Georg went daily to the American Express to enquire whether my letter had arrived and was daily disappointed. As he did not want to spend his vacation waiting for a letter in Delhi, he started off on the usual tourist route—Agra, Khajuraho and Varanasi. After waging a legal war for almost 10 years, the Animal Welfare Board of India (AWBI) and animal welfare activists have won their case against “animal sports” such as Jallikattu, Rekla (bullock-cart race) etc., involving bulls. A Supreme Court bench comprising Justice K S Radhakrishnan and Justice Pinaki Chandra Ghose, in a landmark judgment on 7 May 2014, banned Jallikattu, Rekla and other such ‘sports’. The SC also struck down the “Tamil Nadu Regulation of Jallikattu Act 2009” . Subsequently on June 22, the Madurai Bench of Madras High Court dismissed 18 petitions, pending from 2009, which sought permission to conduct Jallikattu in the State in the light of the Supreme Court’s ban. For over three decades, the South Indian Humanitarian League and Blue Cross of India petitioned the Petitions’ Committee of the TN state legislature to ban Jallikattu and other sports using bulls. In 2004, hearing a petition seeking permission for conducting Rekla Race, Justice F M Ibrahim Kalifulla permitted the “sport” with a rider that the organisers should cause no injury to the bulls. The petitioner had to approach the Madurai Bench of the Madras High Court, as the Ramanathapuram Police had refused permission earlier. In 2006, another petitioner approached the Madurai Bench for the same reason; another petition in the same court was filed by the father of a man who was killed during Jallikattu the previous year. Taking note of the purview of the PCA Act in its entirety, Justice R Banumathi issued an order banning all types of “sports” namely Jallikattu, Rekla race, and other such “sports” causing cruelty to animals. The State Government was made a respondent and the division bench stipulated monitoring of Jallikattu by the local magistrate, district collector, veterinary officers, AWBI volunteers and police; the High Court placed bulls on the list of ‘Performing Animals’ on its own. As the organisers and State Government were desperate to conduct the “sport” they readily agreed to the classification of bulls as performing animals and also to comply with the conditions posed by the High Court. It bears mention that the Tamil Nadu Regulation of Jallikattu Act (2009), which impacts upon the PCA Act (1960) which is a Central act, has not received Presidential assent yet. The AWBI, a statutory body, disagreed with the classification of bull as ‘performing animal’ and took the case to the Supreme Court seeking an immediate stay on the order of the division bench and demanding a complete ban on Jallikattu. Thereafter, on July 27, 2007 the Supreme Court in an interim order stayed the order of the division bench of the Madras High Court. However, on January 11, 2008 the Supreme Court pronounced its final order by banning Jallikattu but permitting Rekla race. The bench comprising Justices R V Raveendran and A K Patnaik permitted Rekla because the AWBI had, by lapse, sought banning of only Jallikattu. When the State Government filed a Revision Petition on 13 January 2008, the same bench heard it and delivered an interim order allowing Jallikattu to be held as part of Pongal celebrations, with some ‘conditions’. The AWBI promptly filed another Special Leave Petition seeking restoration of the earlier order dated 11 January 2008. Even as the case was dragging in the apex court, the State Government tabled the Tamil Nadu Jallikattu Regulation Bill in the Assembly; it was unanimously passed as Tamil Nadu Jallikattu Regulation Act 2009. But the government failed to obtain Presidential assent. Thereafter, the same bench of the Supreme Court gave interim orders in 2010 and 2011 allowing Jallikattu with conditions and directing the authorities to ‘monitor’ the ‘sport’. Meanwhile, Minister of State for Environment and Forests, Jairam Ramesh, in July 2011, included Bulls on the list of animals which may not be deemed to be Performing Animals and may therefore not be allowed to be trained, exhibited or used in sport. The ministry added that Bulls meant cows, progeny of cows, bulls, buffalo and oxen including castrated and not castrated ones. Armed with the notification of MOE & F, AWBI and animal welfare activist Radha Rajan filed separate petitions in the Madurai Bench of the Madras High court seeking a ban on Jallikattu. On 12 January 2012 the Bench comprising Justices Chitra Venkataraman and R Karuppaiah heard the matter, but the government advocates managed to secure another day for the government to be heard again. As the State’s ruling party was also partner at the Center, the Union Government’s Advocate General somehow failed to defend the notification of the MOE & F. The State Government also succeeded in allowing the ‘sport’ to be conducted, as usual with ‘conditions’ (that were never followed) and ‘monitoring’ (that was never done with the seriousness it required). Continuing its relentless efforts, the AWBI monitored and observed the conduct of Jallikattu in 2012 and 2013 and prepared solid documentation with photographs and videographs and submitted its report to the Supreme Court (supporters argue that such cruelties stopped after 2008). The AWBI meticulously detailed the entire process of Jallikattu, the cruelties to which the bulls are subjected and how Jallikattu was violative of various sections of the PCA Act. A petition was filed by PETA against the Tamil Nadu Jallikattu Regulation Act 2009. The organisers of Jallikattu, confident of political support from the State Government and thinking that the TNJR Act would make it easy for them in the Supreme Court, failed to make a convincing case for conducting Jallikattu; they did not present any documentation or proof that there was no cruelty to the animals and proof that they were conducting Jallikattu safely. The Supreme Court analysed the issue threadbare taking the PCA Act into consideration in its entirety. It found the TNJR Act repugnant to the PCA Act and noted that the TNJR Act had not received Presidential Assent under Article 254 of the Constitution of India. Accordingly, it banned Jallikattu, Rekla race and other such “sports” and struck down the TNJR Act 2009 as null and void. Jallikattu – not sport but farce! Following the judgment, the organisers and supporters of Jallikattu are disappointed and agitated. But the ban on the sport is of their making! As long as Jallikattu was conducted as a village sport by the agricultural community, with the involvement of youth from the particular village and under the supervision of village elders and leaders of the said village, it did not attract attention, good or bad. It had its own typical cultural flair and religious flavour; it was traditional in the true sense of the word. But once the sport moved to towns and cities and suffered commercialization (prize money, betting, etc. ), due to greed for money and fame by organisers and community leaders, it lost its uniqueness. Even the “brave” players taking part in taming the bulls are mostly from towns and cities, not rural areas. They are akin to the mad bike racers we see on city roads. The bulls were viewed and treated as objects or instruments of entertainment instead of living beings. This forced the AWBI and animal welfare activists to act against this farce and the rest is history. Arguments for Jallikattu, a travesty! In the name of tradition, it is not clear if the organisers included Indus Valley Seals, verses from Bhagvatam and other archaeological and literary evidences in their defense before the Supreme Court. The argument that twisting tails, cutting ears and using nose-ropes are not cruelties will not cut ice with the Court of law, which views the case under the PCA Act. The organisers had to defend their case under the purview of the PCA Act. They were not able to present a sound defence, because they violated conditions even in 2012 and 2013, four years after these were imposed by the Supreme Court. It is argued by organisers and supporters of Jallikattu that the bulls are sent for slaughter due to the ban of the sport. They claim that the bull is reared with love and affection as a member of the family; taken care of by feeding highly nutritious food with special attention for its well-being; and that as much as Rs. 500/- per day is spent on the bull, all year round. When they can send their own family member to the slaughter-house just because Jallikattu is banned, is not the claim of taking care of the bull with love and affection farcical? Doesn’t this prove that they are for money only? Are they not spending so much because the Jallikattu bull’s market rate is over Rs one lakh? They argue that Jallikattu helps them in protection, preservation and breeding of native cattle. If they really want to protect and preserve native breeds, why should they send the bulls for slaughter just because the sport is banned? Is Jallikattu the only option to breed native cattle? Can’t they use them for breeding, farming and producing biogas, organic manure and other dung-based products? The day the agriculturist replaced bulls with tractors, he lost his credibility; exposed his avarice. The day he started compromising on the genuine tradition of Jallikattu and made it a commercial sport, inflicting pain on hapless animals, he lost his ground for arguments. It is a farce that the bulls are sold for slaughter only after the ban on Jallikattu. Selling male progeny has been happening for years! As he has started selling them for slaughter, he can no more claim that he is passionate about breeding them. Jallikattu organisers and supporters alleged that animal welfare activists were paid by foreign NGOs backed by the Church. They must understand that there is nothing Christian about the AWBI or animal welfare activists, majority of whom are Hindu. Both have an impressive track record in the cause of animal welfare. When Churches are conducting Jallikattu, where is the question of these activists being paid by the Church? Even genuine Hindu activists, who have been serving the cause of animal welfare for decades, have been blamed for being associated with PETA and paid by Christian NGOs! Jallikattu supporters question why animal welfare activists are not fighting against slaughter of cattle, cattle trafficking, circus, etc. This is an ill-informed argument. Animal welfare activists are fighting against all forms of cruelties perpetrated on animals. First, with regards to Circus, the Ministry Environment and Forests issued a second notification dated 14-10-1998 (Annexure-1)4 under Section 22 of the Prevention of Cruelty to Animals Act, 1960 putting restriction on exhibition or training of bears, monkeys, tigers, panthers and lions with effect from the date of publication of the notification. Since then, the number of Circus companies has been on the decline. Second, regarding slaughter houses, the Supreme Court delivered an excellent order  on 23 August 2012 directing both the Central and State Governments to ensure that slaughter houses adhere to the guidelines prescribed by the Central Pollution Control Board, involving the Departments of Health, Animal Husbandry and Labour, State Police, Food Safety Commissioner, State Pollution Control Board, State Animal Welfare Board and two prominent persons nominated by the State Government. Third, regarding Cattle Trafficking, animal welfare activists have worked diligently with limited resources. Ever since a team of committed activists led by Radha Rajan and S V Badri released a documentary “Their Last Journey – Cattle Trafficking to Kerala” , huge awareness has been created on the issue and many activists have formed their own teams across Tamil Nadu to serve the noble cause. In other States too, activists are working to stop cattle trafficking. All animals are the same for animal welfare activists; they do not discriminate between Desi Cow and Jersey Cow, dog and cat, hen and peacock, but work for the protection and welfare of all. Working for animal welfare is not easy; it requires manpower, money power, material power, and above all, support from the State administration and Police. Waging a legal war must also be within the realms of Law and Constitution. Within their capacities and limitations, they are doing a great job. Those who fought against Jallikattu are also fighting against circuses, against cattle trafficking, against cow slaughter, against the government’s religious endowment departments for the welfare of temple cows; they will also fight for the protection and breeding of native cattle! Regarding churches conducting Jallikattu, it is claimed that churches have been conducting this sport in certain parts of Tamil Nadu on the eve of St. Antony’s Festival for centuries! It is a great blunder that Hindus allowed the church to hijack this sport. During the current year when the Church organized Jallikattu in Dindigal, a 12-year-old boy was killed and 23 others injured! The agricultural community should have protested against the churches and safeguarded the sanctity of this Hindu sport. Having allowed the church to conduct Jallikattu, can the argument that banning Jallikattu hurts Hindu religious sentiments stand scrutiny? Even in the present circumstances, the Hindu agriculturists did not fight for the Hinduness of Jallikattu as they feared the Dravidian Government would not support them. The DMK regime supported Jallikattu and went to the extent of making a separate law for it, not in the interest of Hindu religion or Tamil culture, but because it brings money to its coffers and the Church is also involved. This was the regime that changed the traditional Tamil New Year, showing scant regard to Hindu religion and Tamil culture. The pathetic condition of cows and the gaushalas maintained by the HR & CE Department shows the scant regard the government has for religious tradition and sentiments of Hindus! In a recently published Tamil article by Chennai-based Vedic Science Research Center, an author named Aegan  has explained in detail about the attempts being made by Christian priests to purchase native breeds of cattle from farmers in Erode, in order to use them to produce cross-breeds and curtail the growth of native breeds. The article cites evidence that these priests have been indulging in this nefarious activity with the active connivance of the officers of a nationalized bank. It is a very serious issue and the agricultural community must immediately bring it to the notice of the Government and take it up with the concerned banks’ authorities. They must ensure this practice does not spread to other parts of Tamil Nadu, like they allowed the church to hijack Jallikattu. What has St. Antony got to do with Jallikattu? It is clearly an “Inculturation” technique. Hence, it is imperative that the Hindu agricultural community think of a strategy to take the rural sport back to the villages with religious and cultural flavour, as a Review Petition against the ban is most likely to be rejected. It is very unfortunate that this issue has created a rift among Hindus. Supporters of the ban feel that the present day Jallikattu is a mockery of the village sport and more commercial and entertainment than tradition and culture. This is akin to the debate on vegetarianism and non-vegetarianism among Hindus. It is a fact that the Maharishis of Vedic times took some amount of ‘pashu’ as prasad after performing yagnas. But over the centuries, Vedic Brahmins have put an end to animal sacrifice in yagnas, barring very rare occasions like vajpeya yagnas. But none of the Hindu scriptures have strictly enforced vegetarianism for Hindus. The same is the case with animal sacrifices during temple festivals, particularly the village temples, where the gramadevata is served naivedhya by sacrificing animals and birds. Here also we have two sections of Hindus, one for and one against the tradition of animal sacrifice. The point of contention is that the practice of eating non-vegetarian food has become almost a daily affair, unlike the days when it was only during festival occasions and family / community celebrations. Over the years, beef eating has also increased manifold among Hindus and has probably led people to view animals as mere products and not living beings. 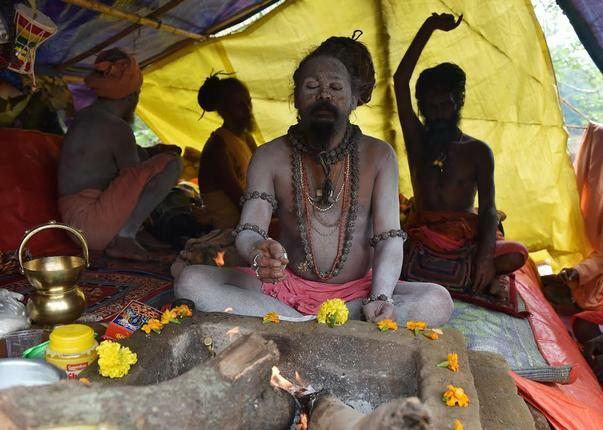 This Hindu nation has a time-tested tradition of worshipping Nature. Our livelihood was in consonance with nature. Natural resources are God’s gift to mankind. But as we started deviating from the tradition of worshipping nature and showing scant regard for nature, we started facing problems. As we modernised our agricultural practices, we failed to strike a balance, resulting in the destruction of our cattle wealth. Similarly, village oriented sports like Jallikattu have lost the traditional sanctity as they became commercialised for money and entertainment. The traditional practice of daily worshipping cattle has become a formal annual event, resulting in cattle being viewed as commodities. It is high time the depletion of cattle wealth stopped and steps taken to increase it. To take back the traditional sports to villages in a new form with truly religious flavor. The prohibition of cow slaughter is a Directive Principles of State Policy contained in Article 48 of the Constitution: “The State shall endeavour to organize agriculture and animal husbandry on modern and scientific lines and shall, in particular, take steps for preserving and improving the breeds, and prohibiting the slaughter of cows and calves and other milch and draught cattle”. Yet successive governments have failed the nation on the issue of banning cattle slaughter. Successive governments have also failed to check and control the mushrooming of hundreds of thousands of illegal slaughter houses, leading to a progression of meat industry resulting in India becoming the world’s highest exporter of beef, a shameful distinction! For a Dharmic nation that worships Cow and its progeny, leading the world in exporting their meat is not only shameful but sinful. The present ruling party at the Centre stated in its election manifesto that it would reverse the so-called Pink Revolution by coming down heavily on slaughter and trafficking of cattle. Right thinking citizens should support Hindu organizations, which must work together for this noble cause by coordinating with the Union Government to ban cow slaughter and export of beef. In accordance with the Directive Principles, the menace of cattle trafficking must also end. For this, we need more Gaushalas. Gaushalas can be set up in every major town and city along with a bio-gas plant in every gaushala; they could be placed under the supervision of temples, possibly on land owned by temples. Centers can be set up in each district to manufacture organic manure, cosmetics and other Ayurvedic products using cattle dung and urine procured from the gaushalas. District-wise Cattle Protection Teams could be formed and connected through a network to stop cattle trafficking and keep a watch on temple gaushalas. Support from authorities like State Police, SPCA and AWBI must be sought to stop cattle trafficking so that the Transportation of Animals Rules are thoroughly implemented. Special care must be taken to preserve the native breeds and increase their breeding by supporting farmers who preserve native breeds. Animal husbandry departments must make regular supply of cattle feed at subsidised rates for these farmers and gaushalas. As organic farming spreads with general awareness of the ill-effects of chemical fertilizers and pesticides, organic manure will find a ready market, leading to a return to traditional organic farming methods. Strategic marketing of cosmetics and Ayurvedic products from cow produce will help in the sustenance of native cattle breeds, traditional agriculture and organic farming. Given our glorious tradition of worshipping cattle, we may adopt new forms to celebrate religious occasions with our cattle wealth. Occasions like Krishna Jayanti and Nandi Jayanti could be celebrated in every village by bringing cows and bulls to the temples, akin to the Arattupuzha Pooram Festival (Thrissur) where elephants are lined up. The people can perform Gau-Puja and Rishab-Puja and individual farmers can be awarded for breeding native cows and bulls during the occasion. Every Shiva temple can have a procession of deities placed on Vrishaba Vahanam during utsavams. Reclaiming the divinity of cattle can check the Church which has already hijacked the Jallikattu, which is no more thanks to the Supreme Court. We must remember that it is we who made non-vegetarian diet more frequent than vegetarian diet; we who opted for tractors in place of bulls for farming; we who promoted a small time village Jallikattu as big time entertainment; we who brought Jallikattu from villages to towns and cities and inflicted barbaric cruelties on bulls in the name of demonstrating our valour; we who promoted chemical fertilisers and disowned organic manure; we who forgot the sanctity attached to agricultural festivals; we who promoted trafficking of cattle, slaughter of cattle and export of beef. Let us correct ourselves and serve the noble cause of preserving our cattle wealth! » B.R. Haran is a senior journalist in Chennai.